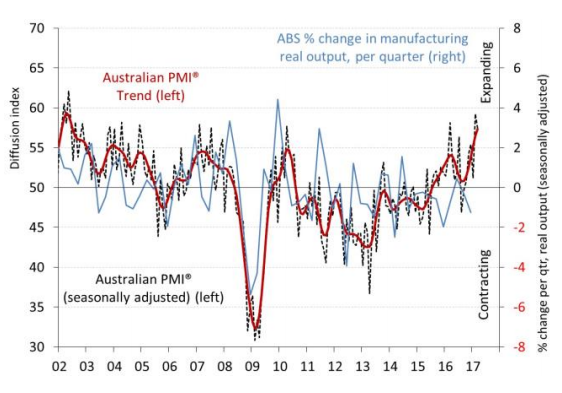 Australia’s manufacturing sector has registered another month of expansion in March even though the latest manufacturing Purchasing Managers Index (PMI) released by the Ai Group came in at 57.5, down 1.8 points on the February readings. 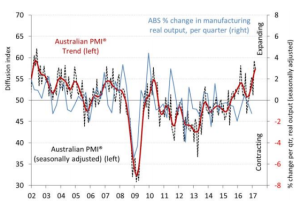 According to Ai Group’s report, all seven activity sub-indexes in the Australian PMI expanded in March, with expansion in new orders (up 2.0 points to 62.6) and sales (up 2.4 points to 57.7) strengthening. Five of the eight manufacturing sub-sectors also expanded in March, with non-metallic mineral products (up 0.6 points to 64.8) and food and beverages (up 1.6 points to 63.4) posting the strongest growth. Another positive is the performance of machinery & equipment (up 0.9 points to 60.5), which continued to grow despite the ongoing exit of automotive assembly. The report also found that the input prices sub-index increased by 4.3 points in March to 65.5, driven by the higher steel and bulk commodity prices and soaring energy costs. The selling prices sub-index recorded a marginal decline (down 0.2 points to 53.5), with manufacturers’ improved ability to recover cost increases still being outpaced by growth in input costs and wages (down 4.8 points to 54.0). Commenting on the March readings, Ai Group Chief Executive Innes Willox said the recovery in Australian manufacturing was largely down to strong expansions in sales, production, employment and exports. “The Australian PMI result of 57.5 points was the sixth successive month of expansion and reflected robust growth in the key sub-sectors of food & beverages; machinery & equipment; metals products and non-metallic minerals,” Mr Willox said. He said although the momentum in the sector was unambiguously good news for manufacturers, there was still ‘a very considerable way’ to go before the country’s manufacturing sector would be able to contribute its full potential in a more balanced Australian economy. “Before this can occur, the current uncertainties surrounding energy affordability, security and sustainability need to be urgently addressed,” Mr Willox concluded.